We all know the power of a deep, dark burgundy lip colour. 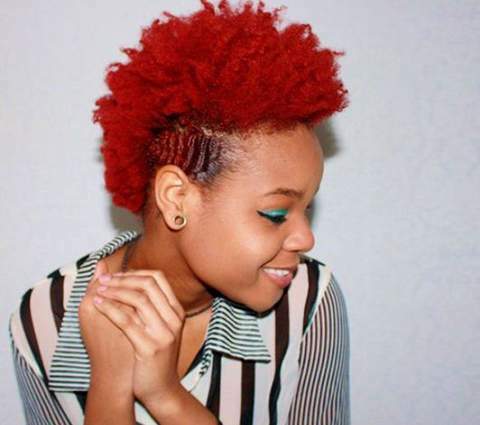 So, why not level up and embrace a beautifully rich and luxurious burgundy hair crown? This rich hair colour is enough to make you feel like an absolute KWEEN. Complemented by your gorgeous, dark complexion, you’ve got yourself a #FierceAF combination. Not to mention, it’s the perfect shade to accentuate your facial features. Trending hair colours aren’t just about bringing out your playful side, it’s also important to know how to maintain your luscious hue too. Read on to be inspired by these burgundy hair colours fueled with burgundy bliss. From natural crowns to sleek and straight hair, we’ve got the colours to suit your style topped with tips and tricks for long-lasting colour. Once you’re all clued up, pick a hair colour that speaks to you and gets you ready to transform your style. 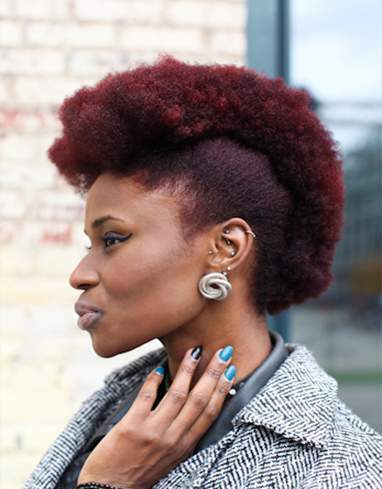 This blend of Inecto Burgundy Bliss is effortlessly styled in a faux hawk that shows off the perfect blend of burgundy hair hues. This sculpted hairstyle and deep red hue will emphasise facial features like your cheekbones and jawline. It’s bound to give you that perfect selfie side profile. Highlight your natural beauty with deep red hues. A red wine inspired hair colour? We’ll have more of that, please! This cool toned colour packs the perfect blend for autumn. Inecto Plus Red Wine hair colour comes with an easy to use applicator and an Aloe and Protein conditioner to ensure your new colour is left with a healthy shine. Pair this colour with bold blue eye make-up and you’ll be serving them BIG STYLE ENERGY. And we’re totally here for that. That’s exactly what you’ll be doing with all the comments from your Burgundy Blush coloured hair. 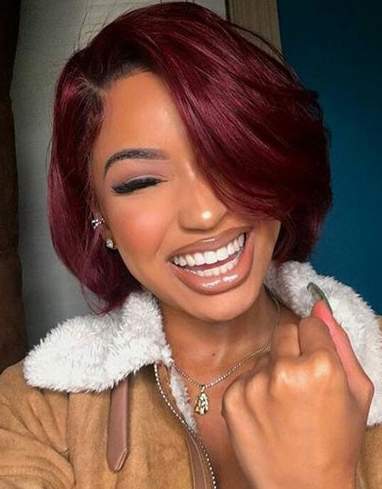 Short do’s are sweet, but ones that are styled straight and sleek and are adorned with a #winning smile are even better. Inecto Unlimited allows you to effortlessly achieve that sleek relaxed look on the same day that you colour your hair. We’ve also added in a shine serum to make sure nothing gets in the way of your #GlowUp. Infused with Jojoba oils it makes a slaying combo of burgundy bliss. Once you’ve got your colour choices down, it’s important to know how to keep your hues lit. We’ve put together 3 essential tips to help you keep your hair colour constantly turning heads. The temperature of the shower heat opens up your hair cuticles that can lead to your fresh colour running and your luscious locks losing moisture. 2. It’s a strong NO on the hot tools. Blow dryers and straighteners can speed up your colour fading. Although they’re ideal for achieving amazing hairstyles, you should stay away from hot tools for the first week after you colour your hair. Conditioning masks get deep into the hair follicles (total win) but when rinsed out, tend to make your colour run (uh, no thanks). It’s best to stick to a daily conditioner instead. Are you ready to level up your hair game this season? Rock any of our deep red hues and give your style MAJOR on-trend cred. Don’t forget to share your hair colour changes with us. 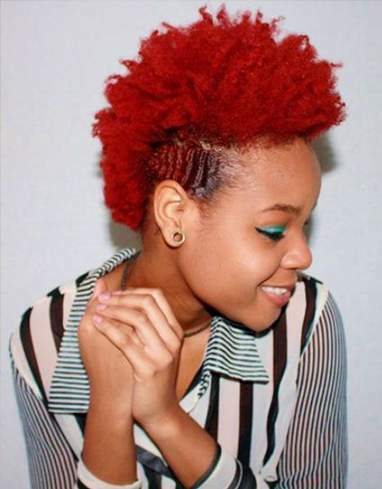 We love seeing you embrace your bold confidence. Who knows, you could even be featured on our social media as total hair colour inspo. Which will you be trying first?